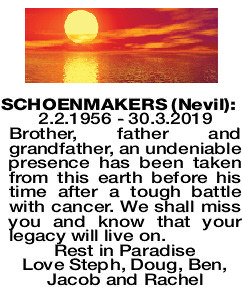 SCHOENMAKERS NEVIL 2.2.1956 - 30.3.2019 Brother, father and grandfather, an undeniable presence has been taken from this earth before his time after a tough battle with cancer. We shall miss you and know that your legacy will live on. 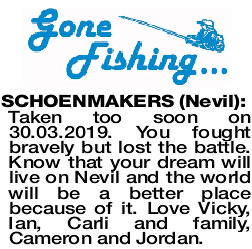 SCHOENMAKERS NEVIL Taken too soon on 30.03.2019. You fought bravely but lost the battle. 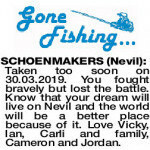 Know that your dream will live on Nevil and the world will be a better place because of it. Love Vicky, Ian, Carli and family, Cameron and Jordan.